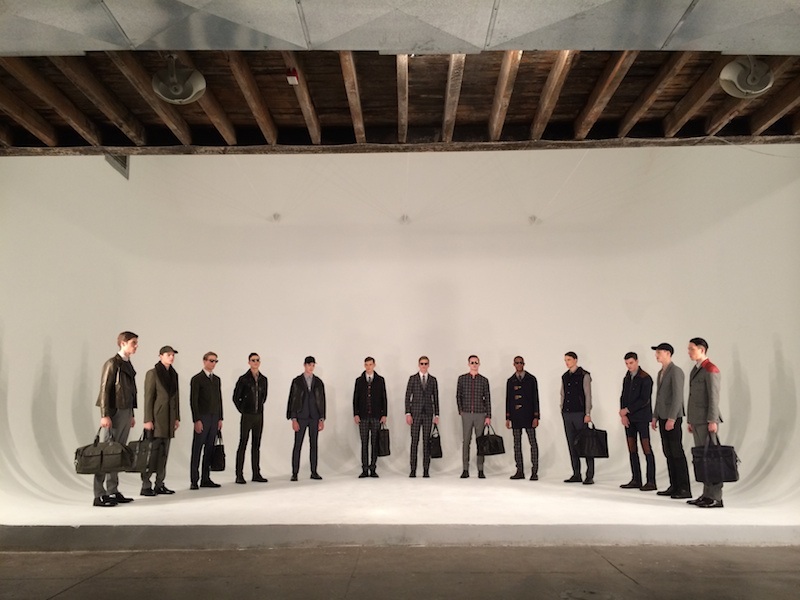 Held in the too-cool Industria Studios space, the Ernest Alexander Menswear Fall 2014 presentation was a gentlemanly escape during NYFW. As we walked in, we were presented with head-to-toe polished duds and fantastic outwear pieces that stuck in our minds the entire week. Our editor [Brigitte] had a chance to chat with designer Ernest Sabine about the set behind-the-scenes, where he explained about his recent foray into clothing. What was first an accessories line soon turned into this menswear front-runner…and we’re so happy it did. Blazers, coats and leather jackets are tailored masterpieces. Not to mention the retro houndstooth suit one of our favorites, Justin Sterling, sported. Always great to say a quick ‘hello’ to Andre Bona too, who was wearing one hot vest and button-down combo. These are pieces for a guy who knows how to dress…and dress well. No room for sportswear longings, this is high-fashion, high-sophistication perfection. Also loving the brown leather ‘knee pad’ pant detail. A bit of ruggedness to throw into the mix? We think yes. We can feel the vintage moto racing spirit infused into this collection. With the added sunglasses, it all comes to life. Ride on. fdmLOVES ERNEST ALEXANDER Menswear Fall 2014 selects by Brigitte Segura, written by Allison Ripa.